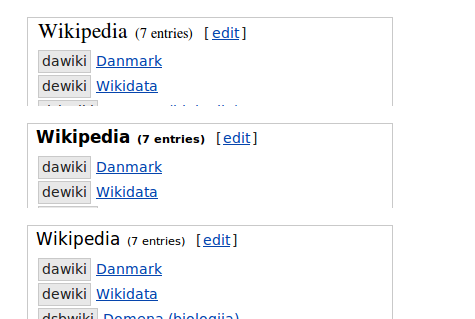 A Wikidata item is basically separated into two sections, one for statements and one for sitelinks. Both sections should be collapsible on mobile view and appear in the toc on tablets. The two options we have are either changing the DOM structure of item pages to fit MobileFrontend requirements or make MobileFrontend less restrictive about what to recognize as a headline. Bene raised the priority of this task from to Normal. Bene added projects: MediaWiki-extensions-WikibaseRepository, Readers-Web-Backlog, Wikidata. Bene added subscribers: Bene, thiemowmde, adrianheine and 6 others. Bene set Security to None. As suggested above, the best way to implement this is perhaps do both changes. There should be a "sitelinks" heading immedeately before the sitelinklistgroupview container but MobileFrontend should also allow headings which are not direct descendents of the #content element. When implementing the Wikibase part, we must make all sitelinklistheadings from <h2>s to <h3>s. This will change there styling a bit as Vector renders <h3> quite differently. This is not resolved yet as https://gerrit.wikimedia.org/r/#/c/203874/ is still awaiting review. The MobileFrontend part however is finished already. After the patch, with the suggested font-weight: normal. JanZerebecki closed this task as Resolved. JanZerebecki added a subscriber: JanZerebecki. Sorry, this was almost merged but is not yet. thiemowmde mentioned this in rMEXT729c026580e1: Updated mediawiki/extensions Project: mediawiki/extensions/Wikibase…. Bene closed this task as Resolved.